Are you looking to buy a wool trench coat and confuse about the selection and colors of the coats? 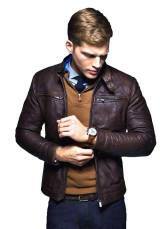 In this regard, William jackets can help you. With a cluster of satisfied customers throughout many years, we have reached the level of satisfaction and quality assurance. Our testimonials are our proud. William jackets introduce The Detective Sherlock Holmes Benedict Cumber batch Wool Trench Coat. This is the traditional and the William Jackets best. A trench coat in grey never goes out of favor grey wool, distressed or no longer, may be worn with any color, and will still look as cool, if now not cooler, a decade from while you buy it. This is perfect for any fashion. It is made up of wool blend with internal viscose lining inside the coat for a warmer feel. Its double-breasted button closure with lapel style collar makes it more unique and stylish than any other kind of wool jacket. This desire is ideal for the town cruiser appearance or even a more innovative take at the greaser. Remember, be bold, preserve it balanced, let the evidently exciting jacket do the work for you and you will never be disappointed through this piece. To be flawlessly sincere, we think wool coats are one of the most versatile and long-lasting style purchases a man could make. This wool coat, mainly, has an extraordinary balance of traditional 50s vibes and modern manliness. It's reliable, relaxed, and may set the stage for a head-turning outfit. So, select The Detective Sherlock Holmes Benedict Cumber batch Wool Trench Coat. It will never let you down in any type of weather.Inside the story of Sherlock Holmes,On this update of the Sherlock-Holmes thriller saga, Holmes tracks down and kills the infamously murdered Black-wood, who is rumored to be a sorcerer - a great deal to Holmes' discredit. Three months later, a series of murders similar in nature to the ones of black-wood's start turning up, and to make topics stranger, his frame disappears from its grave. It's as much as Holmes and the soon to be married Watson to remedy this mystery, but the mystical and unexplained issues the duo stumble upon makes the strictly logical Holmes question himself. This all corresponds with the sudden arrival of Holmes' former rival and love interest Irene Adler. Holmes needs to music down Black-wood and get to the bottom of this thriller before all of London is destroyed by using the dark villain's evil plot.